Home /Hes the 19th Democrat to declare. Rep. Seth Moulton of Massachusetts announced he’s mounting a bid for president in 2020, expanding the Democratic field to 19 candidates. “I’m here to tell you, and to tell America, that I’m running for president of the United States,” Moulton told ABC News Chief Anchor George Stephanopoulos on “Good Morning America” Monday. Moulton, a former Marine and three-term congressman from Massachusetts, is one of many Democrats from Capitol Hill to join the race, including potential front-runners like Sens. Bernie Sanders of Vermont, Elizabeth Warren of Massachusetts, Cory Booker of New Jersey and Kamala Harris of California — not to mention other Democrats who don’t currently hold office in Washington but are making a splash, like Mayor Pete Buttigieg of South Bend, Indiana, and former Texas Rep. Beto O’Rourke. I think I’m the only candidate who actually gets single payer health care. He used health care as an example. He stands apart from many of his primary opponents, including Harris, Warren, Sen. Kirsten Gillibrand and Booker, who support Sanders’ Medicare for All bill that would eventually replace the Affordable Care Act with a single payer system. Moulton, a former Marine who served in Iraq, is known as an outspoken critic of his own party. He was elected to the House in 2013. “I returned home and decided to run for Congress because I realized that a lot of Americans are feeling betrayed by Washington the same way that we did in Iraq. Ask anyone who’s lost their job to a changing economy, or a child to opioids, or has to choose between heat and food in the winter, they’re feeling forgotten,” Moulton said in his announcement video posted on Twitter Monday morning. At 40, he’s the second-youngest candidate; he is three years older than Buttigieg, whom Moulton has described as a friend and fellow veteran. He’s also the third candidate who represents Massachusetts, joining fellow Democrat and 2020 candidate Warren and former Gov. Bill Weld, the first Republican to challenge President Donald Trump ahead of the primaries. Moulton pushed back on Warren, who on Friday called for the House to open impeachment proceedings against the president. Though Moulton called for the House to start debates around impeachment last year and said he does believe the president obstructed justice, he also said the Mueller report didn’t deliver the “big smoking gun” for the House to move to a vote. “I think our party made a mistake by waiting for a smoking gun in the Mueller report and there’s not a big smoking gun like we were hoping for. There is a smoking gun about our national security. I mean, we all should be asking, Democrat, Republican alike, why Putin wanted Trump elected president,” he said. 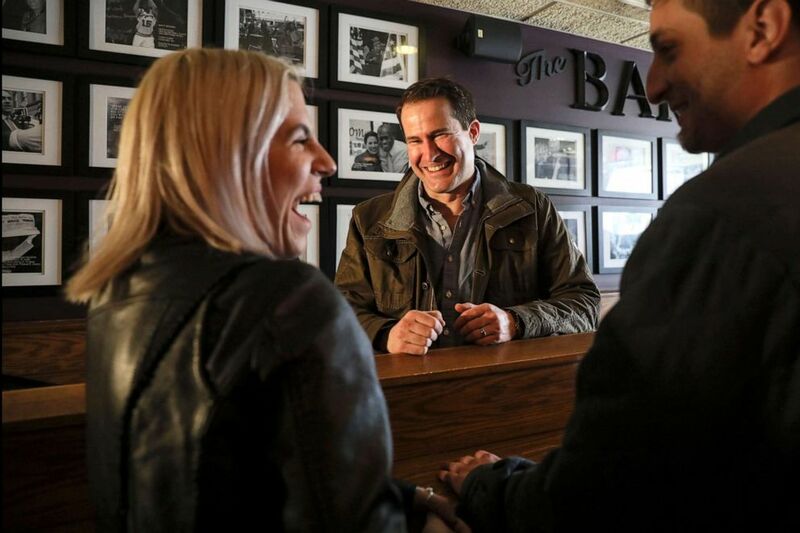 Rep. Seth Moulton meets with patrons after participating in the Pints and Politics event held at The Barley House in Concord, N.H., March 16, 2019. But he knows it won’t be easy. “I’m going to tell [primary voters] that beating Trump is going to be harder than they’d like to think,” Moulton said. Moulton is no stranger from straying from party leadership. In 2018, he was part of the small minority of Democrats who voted against Nancy Pelosi returning to the speaker’s chair. It was not the first time he bucked party leadership — it’s also how Moulton started his career. They said you’re going to lose, and by the way, you’ll never run for anything again because you don’t challenge the establishment. “They said you’re going to lose, and by the way, you’ll never run for anything again because you don’t challenge the establishment,” Moulton said in an appearance on “Late Night with Seth Meyers” in 2018.